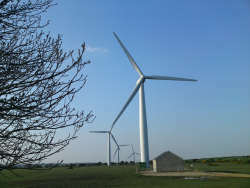 A new wind farm community benefits fund has been created which brings an extra £40,000 a year of grant funding to benefit community groups in Trimdon and the surrounding areas. Energy giant E.ON has set up the new fund to benefit villages within a 3 mile radius of their new wind farm at Butterwick Moor. The fund will be managed by County Durham Community Foundation and joins the likes of EDF Trimdon and the Walkway Wind Farm, two other wind farm community benefits funds which have funding available specifically for the Trimdon area. Grants of up to £5,000 are available for community and voluntary groups to help fund activities, improvements to community buildings, biodiversity, habitat, energy conservation and community-based projects. Examples of projects which have received funding from the community benefits funds in the past are the Trimdon Colliery Homing Society to purchase new timing clocks, the Trimdon 2000 Coffee Morning group to fund activities, various Banner groups, Scout & Guide units and Community Associations. Established in 1995, County Durham Community Foundation is an independent grant-making charity. We promote lasting charitable giving, by bringing together donors with their chosen causes, through well targeted grants that make a genuine difference to the lives of local people, acting as a vehicle for individuals, families and companies who want to put something back into their local community, either in their lifetime, or through leaving a legacy. Since 1995, County Durham Community Foundation has made grants of over £17 million to groups and individuals across County Durham & Darlington on behalf of our donors. We currently manage around 120 funds which are all unique and tailor-made to suit the donor. The Foundation is managed by a board of 14 trustees – professionals drawn from all sectors of the business and voluntary communities. Our President is the Lord Lieutenant of County Durham, Sir Paul Nicholson and other Vice Presidents include Professor Chris Higgins, Alasdair MacConachie, Rt Hon. Tony Blair, David Bellamy and Sir Harold Evans. Similar to having a charitable trust but without the legal and administrative costs, donors can choose from a number of ways to channel their charitable giving by setting up named funds for the causes close to their hearts.